As my ‘raw’ adventures continue I find myself viewing the fruits and vegetables in supermarkets and roadside stalls with an almost reborn eye. This ice cream came about as a glut of soursops came into my line of sight and instantaneously caught my imagination. 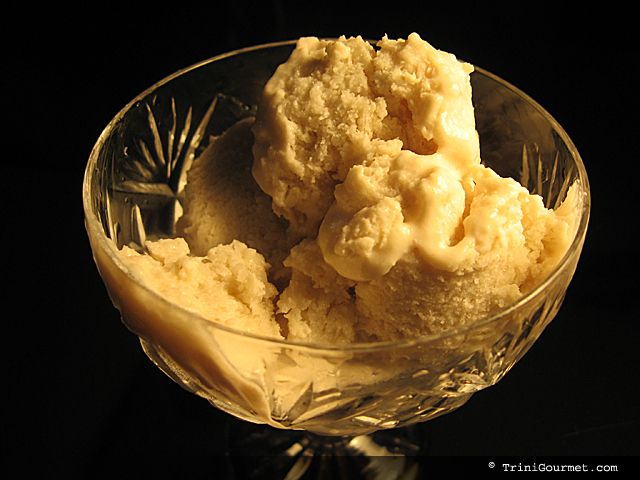 Soursop ice cream was a vague but pleasant memory from my childhood. For an extremely short time period in the early/mid-80’s my parents owned an ice cream maker. After a few months they got bored with it, and it was placed on a shelf only to gather cobwebs, dust and ‘mysteriously disappear’. But for a few short glorious months I would sit on the kitchen floor staring at my mom as she fed salt and ice onto the sides of the machine while it churned. Coconut, Vanilla, Rum and Raisin and Soursop were her favourite flavours and almost effortlessly became mine as well. Making this ice cream was thus both exciting and sentimental. 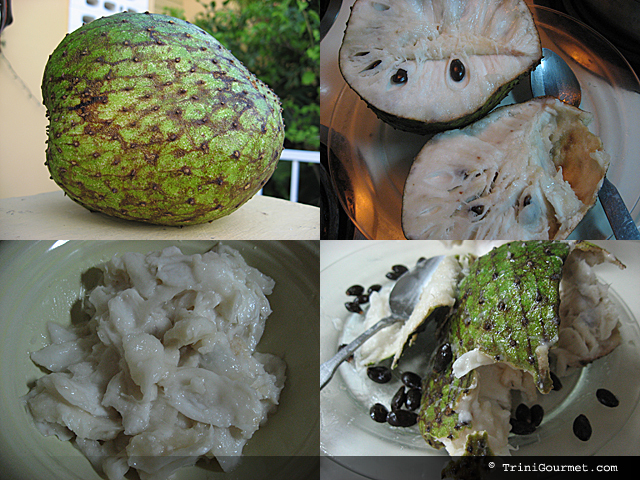 This was my first time cutting open a raw soursop for myself, and J’s first time tasting a raw one. He couldn’t believe how much like icecream it already was straight out of the flesh! I quickly realized that soursop is a tricky thing, soft pulpy areas intermingle with tough fibre, and all throughout shiny black seeds are dispersed, hidden by a thin cloudy membrane. After savagely procuring all the pulp that I could, it was a cinch to blend it with the remainder of the ingredients and put it to freeze. The soursop is a broadleaf flowering evergreen tree native to Mexico, Central America, the Caribbean and northern South America. Today, it is also grown in some areas of Southeast Asia. It is in the same genus as the cherimoya and the same family as the pawpaw. In most Spanish speaking countries it is commonly known as Guanábana. In the Philippines, it is known as guyabano. 1. Blend all ingredients until creamy and smooth. 2. Add water as needed to keep the mixture circulating through the blender.